Need more information about booking Home 7302929 ? On the trendy PLATEAU MONT-ROYAL, minutes of the street MONT-ROYAL (where you will find more ...) or rue LAUREL which to take his time ... The apartment (completely renovated in 2012) is located on the Chabot street (very quiet), in a century-old building, facing a charming little park (with a playground for children). This is a 40sqm studio with all amenities: room with double bed, sofa bed in the lounge, light bathroom, fully equipped kitchen (dishwasher), washer / dryer, air conditioning , TV / cable, unlimited high-speed WiFi, bedding provided. The front balcony overlooks a beautiful little park and the back porch overlooks a lovely green lane. On the very trendy PLATEAU MONT-ROYAL, close to MONT-ROYAL street (Where you'll find all you need ...) or the more laid back LAUREL street ... The studio (completely Call renovated in 2012) is one Chabot Street (very quiet) in a plex built in 1905, in front of a nice little park (with a great young children's playground). The 400 square feet apartment has a twin bed and a sofa bed in the living room section. The kitchen is fully equipped (with dishwasher). 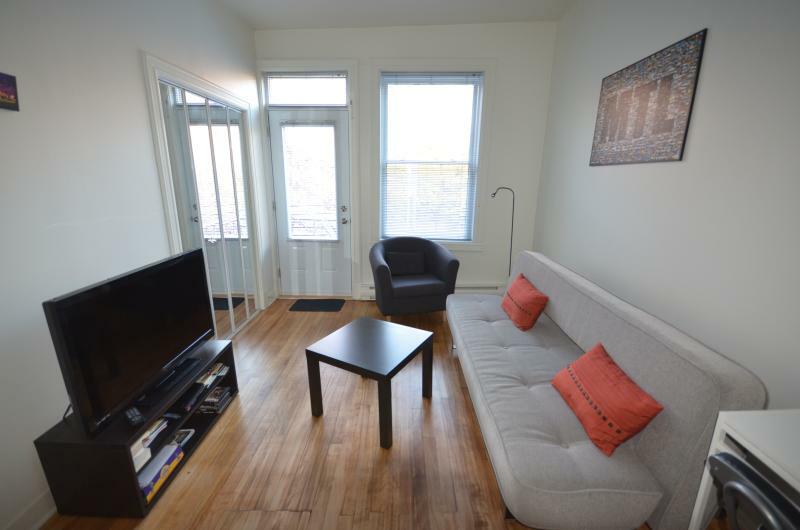 The studio aussi: has a washer / dryer, air conditioning, unlimited hi-speed wifi and cable tv. Bedding & towels are included. The balcony looks onto the front a beautiful little park and the back balcony looks down onto a green alley. Enjoy excellent transport (bus, metro, Bixi bike ...), and shopping in an environment that combines peace and greenery in an urban setting. In 2 minutes walking you can rent a car. - The tenant must notify the landlord of any BREAKING OR DAMAGE caused during the stay. - Follow all instructions related to the use of the apartment. You can get in touch with Véronique (the owner) through the contact form on this page. Send Véronique (the owner) an email through the contact form on this page. Alternatively, if there’s a phone number on this page, you can call them. How do I contact Véronique (the owner)? If you’ve already booked, go to Manage your holiday booking to view Véronique the owner's contact details or send them a message. Or send Véronique (the owner) an enquiry through the Contact the owner/manager form if you’d like a quote or more info first. When you pay online through the Book your stay form, a booking request is sent to Véronique (the owner). You’ll find out within 24 hours whether they’ve accepted - no money will leave your account before then. You can also request a quote from Véronique (the owner) through the contact form. The owner will email you the total cost for your dates and a link to book and pay online. Use the Book your stay form to pay provisionally online. You can pay by credit/debit card or PayPal. Véronique (the owner) will have 24 hours to accept the booking and no money will leave your account before then. Why can't I call Véronique (the owner) before booking? You’ll need to contact Véronique (the owner) to do this. Send them a message in Manage your holiday booking or through the contact form on this page. You can request to change the dates or number of people on your booking via the Manage your holiday booking page. To change your holiday dates use the Edit booking button. If you need to change the number of guests staying then send Véronique (the owner) a message. If Véronique (the owner) agrees, they’ll send you a revised quote outlining the changes. You can review and accept/decline this from the Manage your holiday booking page. You’ll have 48 hours to take action before the revised quote expires. Estimated price per night based on a weekly stay. Owner fees of £38.00 per stay may apply. Enter your dates to see the total cost.